We speak to runners every day and know that leaving that front door to go for a run can seem a daunting prospect. Follow this 12 – point fool proof guide to prevent making those age-old mistakes and keep your marathon training simple and fun! Invest in a proper pair of running trainers from the word go to prevent injury and make the running more comfortable. Go to a proper running store, explain you are new to running ask for a ‘gait analysis’ so that the trainers are properly chosen and fitted to your foot and running style. Good running shops are there to help and make sure you speak to an experienced member of staff! Its also worth investing in some running kit made of running specific technical fabric. This is vital to aid comfort, they will help wick the sweat away from the skin, feel less heavy and support the correct areas. Starting with 3 times per week or every other day, is generally a safe place to start and this can be progressed, as the body gets stronger. Be prepared to walk/run if building fitness and gradually reduce the amounts of walking in the weeks ahead. 20 minutes might be 1 minute easy run/ 1 minute brisk walk in week one but by week 4 could be 20 minutes continuous or 4 minutes run/ 1 minute walk….. Follow one of our training plans or a plan written by another top coach. Cherry pick the long run, threshold sessions and easy pre-breakfast runs. Slot these into your busy week. If you can run more then consider adding a weekly hill session in the early weeks and change this to more marathon paced practice in the final 8-10 weeks. 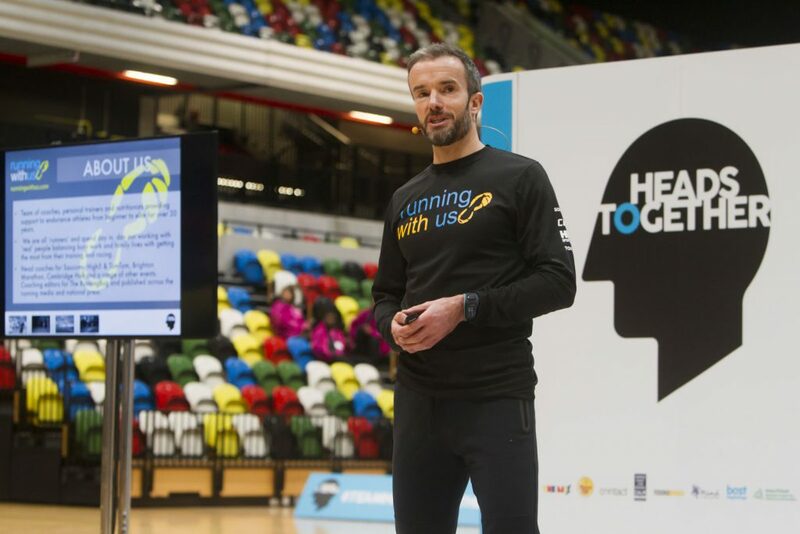 If very experienced you should consider adding some faster interval sessions to your marathon plan some weeks keeping in touch with speed and higher intensity efforts.…but as always, make sure you are recovering well and not getting too tired or sore. Use the plan only as a guide and make the key ingredients work for you. Try not to fixate over these. Good plans will have you increasing your long run by 10-15 mins each week and may include a cut back week or easier week every 3-4 weeks. 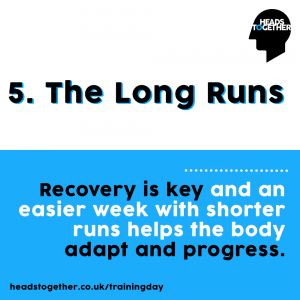 Recovery is key and an easier week with shorter long run every few weeks helps the body to adapt and progress. Long runs in the early weeks should be very conversational and for the experienced actually 30-60 seconds a mile slower than The LongRusyour planned marathon race pace. For the beginner’s they should be run at the speed of chat…fully conversational running. Never be afraid to include walk/run sections and aim to be consistent rather than fast then slowing. In the last 8-10 weeks, it is wise to include long runs with blocks or periods of your planned marathon race pace built in if targeting a time. 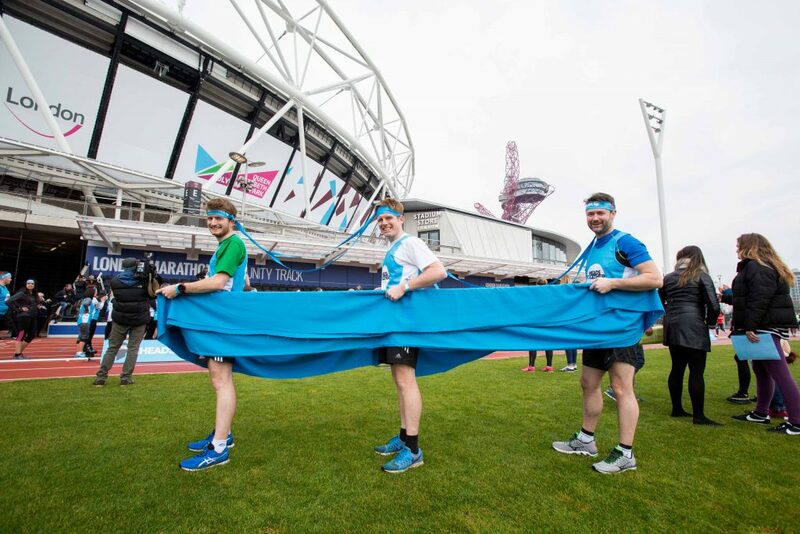 You could be clever and target a couple of half marathon practice races within your build up. These are great long runs with others and race day rehearsal. Make sure you fuel your long runs with breakfast being eaten 90 minutes – 2 hours before and take on energy gels or sports drink every 30-45 minutes. Sip water occasionally or sports drink to remain hydrated and practice this whilst running or walking. Be careful not to drink too much! A simple stopwatch or GPS can tell you how long you have been running for, can give you distances and even paces that will all help when structuring lengths of runs or blocks of run/walking and following your plan. Be careful to not become addicted to the numbers and stats though. Your perceived effort over time is still the smart way to train…but it’s equally great to see your fitness and distance improving over the weeks. A GPS will also help you keep to your marathon pace when required in certain long runs or on the big day. 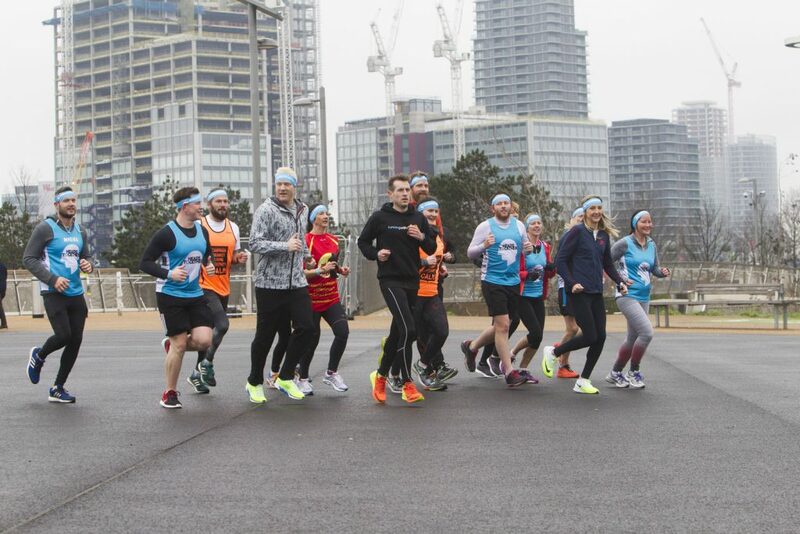 Look into any local running groups and clubs you can join in order to run with others. Try checking RunEngland (www.runenglad.org) for local running set ups geared at beginners in your area. Many of the leading retailers also host runs and group training from their shops for all levels of experience. 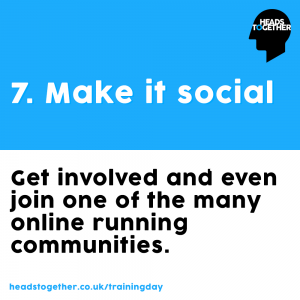 Get involved and even join one of the many online running communities. You will soon find support, motivation and people to run with on those long or harder runs you may have been dreading. Choose routes that are all of the above: Safe, sensible and interesting. Incorporating lots of ‘off road’ such as grass or trail alongside tarmac running is most desirable as this is kinder to the body and joints. Your route may start off as a loop of a park locally to you and build from there. Always tell somebody where you are going and for roughly how long. As the weeks build you can become more adventurous trying new routes as you travel further. 9- Pace yourself…The Tortoise was right! Too many beginners say to me ‘but I can’t even run for a bus’… that’s because when you run for a bus you are usually charging along at full pace hoping it won’t leave you behind. 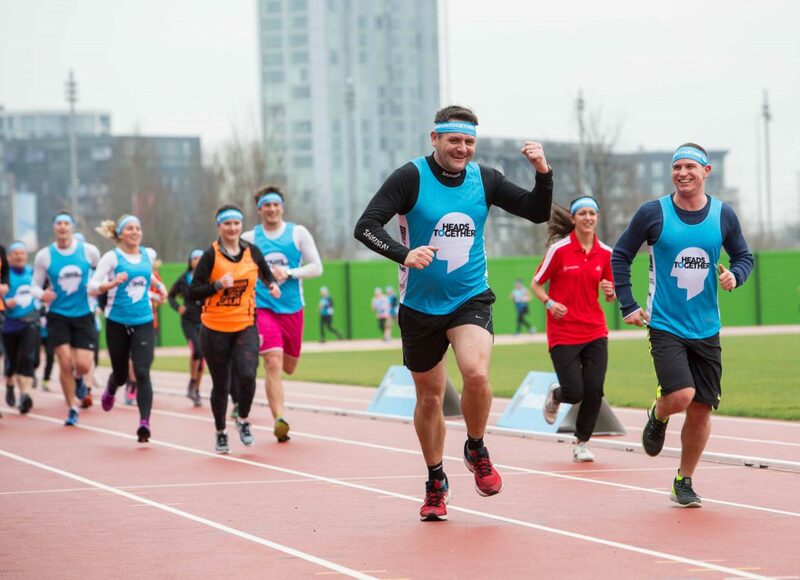 When starting out with running please learn to ‘run at the speed of chat’ as if I were next to you and you are able to talk to me at all times when running. This for the experienced is your easy run or recovery run pace. For those new to the marathon the easy speed of chat theme builds in length and may become your long run and even race day speed. If you are chatting, you are not going too fast!! There is a lot of literature on running technique but initially please simply run naturally and comfortably just remembering these three things; feel tall, light and always aim for a very slight forward lean. Relax the shoulders and elbows in preventing the arm and hands coming across the body. Great athletes are relaxed even when running hard…don’t fight it, breath and be in control. More depth on this area can be explored as you develop as a runner. These are vital as a strong body will support the running and prevent injury. These only need to be very simple exercises that can take minutes in your living room. Stretch the key muscle groups regularly and certainly after every run. For example, glutes, (bottom muscles) hamstrings, quads and calf muscles as this will aid prevention of injury and improve recovery. Find somewhere comfortable to stretch and spend 5-10 mins each day helping the body to feel better. You could even join one or two Yoga or Pilates classes as well. The wise runner will eat healthy balanced meals and snack between these on nutritious and energy rich treats. We always say “never hungry and never over full”. You need to think about fuelling your next run, remaining fuelled on your current run and recovery from the last run. Eat plenty of good sustainable carbohydrates such as brown rice, whole grains and don’t just eat pasta! Be sure to also focus on quality protein as this is the building block to your recovery. Plenty of fruit and vegetables to give your body the vitamins and minerals needed on aa daily basis as a busy runner. It’s always worth spending a little time preparing and getting your nutrition right. If you want to avoid injury and illness your nutrition along with quality recovery is key. Enjoy the journey and be sensible!